Chevrolet’s C7 Corvette is an amazing vehicle; the Z51 2LT option as seen here specifies a seven-speed manual transmission, Magnetic Selective Ride Control adaptive suspension, 13.6-inch-diameter front brake rotors, and a slippery 0.29 coefficient of drag to go with the carbon-fiber hood and roof panels. The 6.2-liter LT1 engine offers 455 horsepower and 460 lb-ft of torque, and the car offers 0-60 times in the sub 4.0-second range, a dual-mode active exhaust system, and even turns in solid fuel economy numbers. All of these components come together to offer an exceptional driving experience. However – as with most performance vehicles – there is always room for improvement by the performance aftermarket’s development efforts. 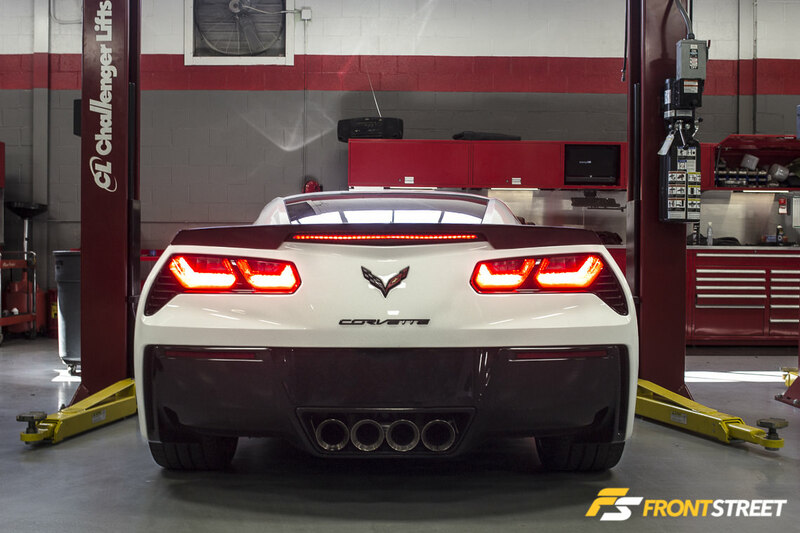 The theme behind the engineering process at Hotchkis Sport Suspension is “Making a Great Car Even Better”, and it’s with this mantra in mind that the company set out to build a set of sway bars to improve the C7 Corvette’s performance both on the street and at the track. The company’s research and development efforts are tested using their in-house 600-foot slalom course, 200-foot skidpad, and their own 14-turn autocross course. 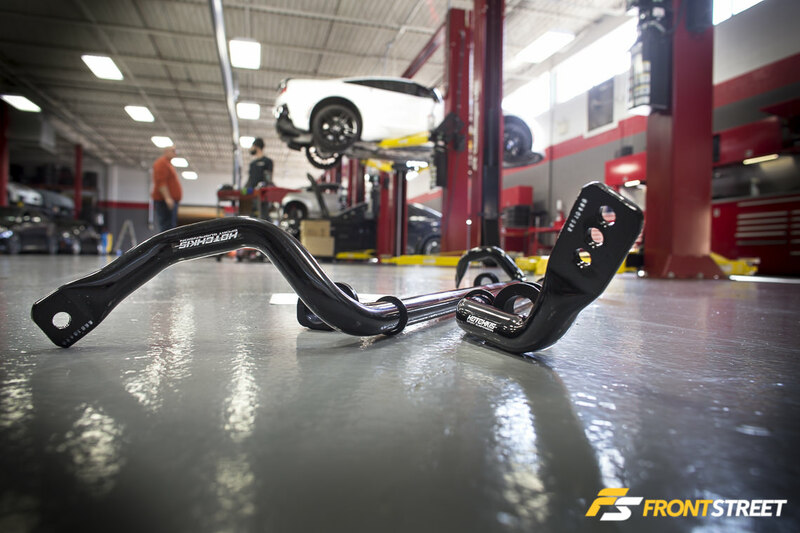 The Hotchkis sway bar kit for the C7 Corvette offers an adjustable rear sway bar and a much stiffer front bar, designed to improve performance while retaining acceptable ride quality. “The Corvette has such high handling capabilities already, so we drive different versions of the car on the road and on the track, and then determine how it can be improved,” says Hotchkis founder and lead suspension guru John Hotchkis. R/T Tuning’s Pat Dulcey took the path of least resistance during the install; rather than removing the end links with each bar as the instructions note, he removed the bars only. 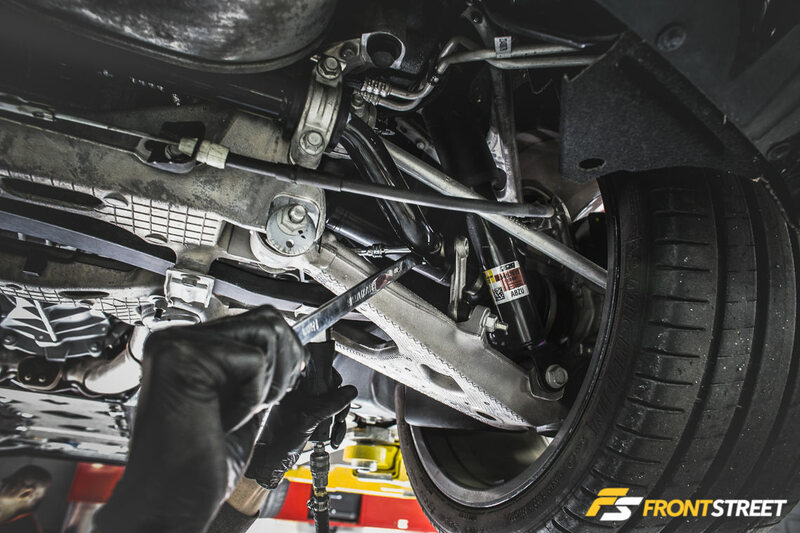 With an eye toward improving C7 performance, they’ve engineered these sway bars with a number of notable improvements designed to take the car’s handling to the next level without wrecking the ride compliance or street-going nature. 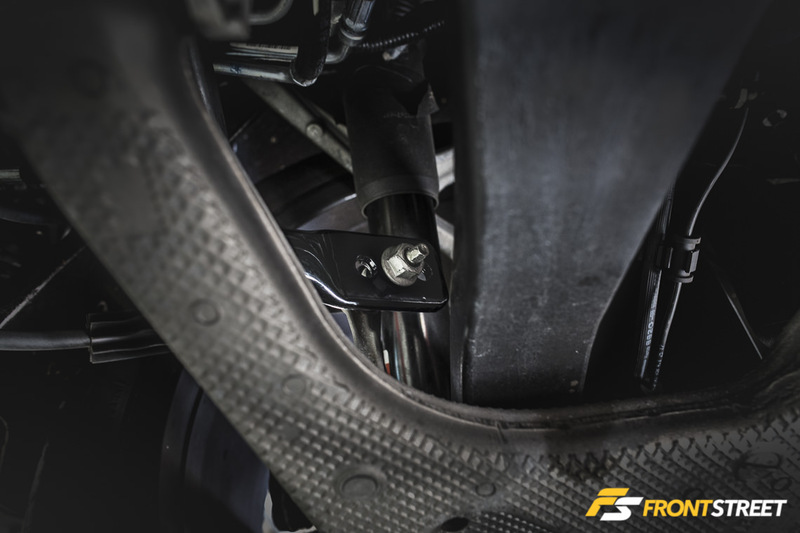 The factory front sway bar on the Z51 measures 28 mm; the new Hotchkis unit is 32 mm for a 4 mm thickness improvement (appx. 5/32-inch). The Hotchkis chromoly bar provides an even bigger improvement over the base model C7, which uses a 26.2 mm front bar. Overall stiffness is upgraded by 55 percent over the stock Z51 bar. Here the difference can be seen between the OE and Hotchkis rear bars, including the adjustable mounting hole positions. In the rear, the Z51 bar measures 31 mm when Magnetic Ride Control is optioned; without it, the OE bar is 26.5 mm. Conversely, the Hotchkis bar comes in at 34 mm to offer a substantial enhancement in stiffness. The rear bar is adjustable, offering three separate mounting positions, corresponding with 20 percent/42 percent/70 percent stiffer than the stock Z51 units. 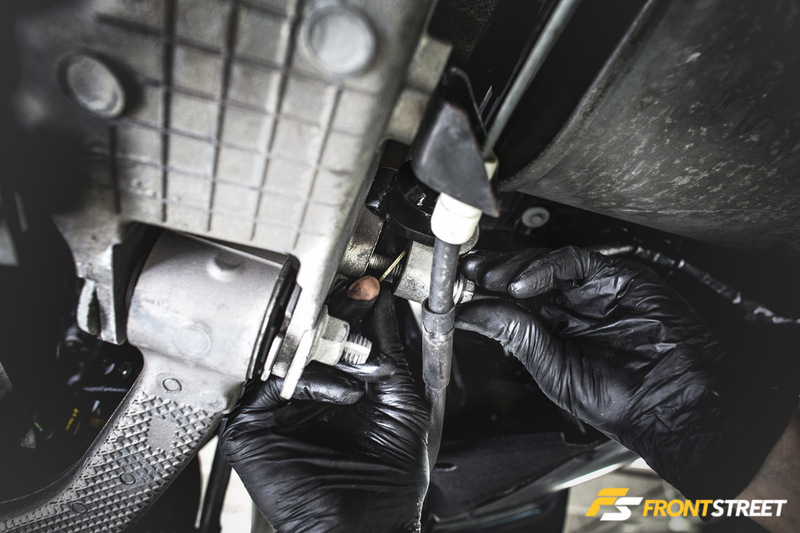 The new bushings used with the Hotchkis bars are much stiffer than the OE units; silicone grease is provided to ensure unwanted noise is not transmitted as the suspension operates. 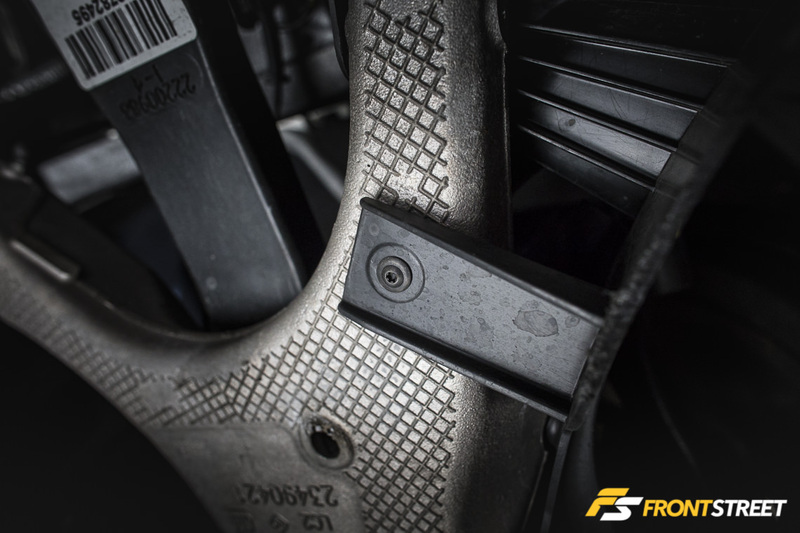 In a Z06 application, the Hotchkis front bar is 35 percent stiffer, while the rear piece offers 5 percent/25 percent/50 percent more stiffness than the OE bar depending upon mounting hole selection. 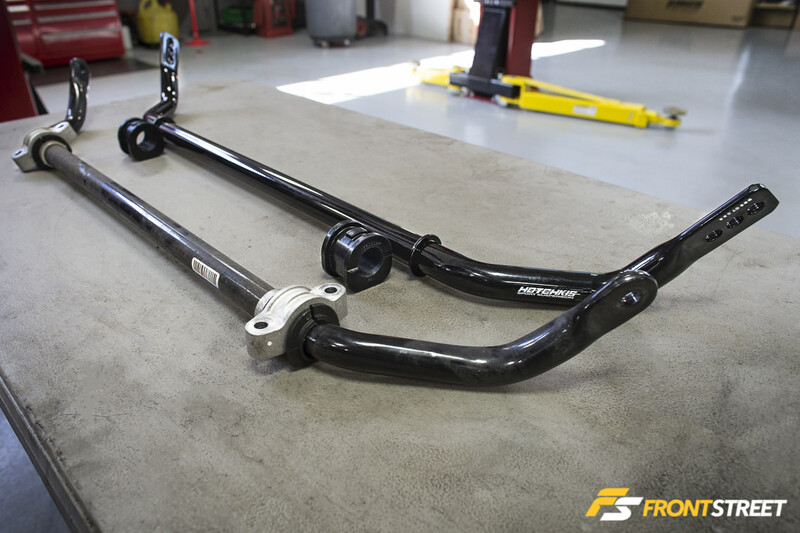 The sway bars are delivered with a set of high-durometer polyurethane bushings, are encased in gloss-black powdercoat to ensure long life, and are made right here in the United States. For street cars, Hotchkis recommends retaining the factory end-links to maintain ride quality, although the company does offer adjustable rod-end link kits for track-only applications. The CNC-bent, hollow larger-diameter bars are designed to elevate performance greatly in all street-going situations, and even at the track. In the rear, there are thin spacers that are placed between the saddle brackets and the frame before everything is locked down. The installation process was not difficult; in fact, there was barely enough time to get the camera warmed up, and then Pat Dulcey of R/T Tuning in Montgomeryville, Pennsylvania, who performed the installation, was hot and heavy into the swap. The new rear bar set into place. The work was performed on the rear of the car first. There are six fasteners here – one nut on each end-link, and two bolts on each saddle bracket – then the bar was ready to pull out of the car. 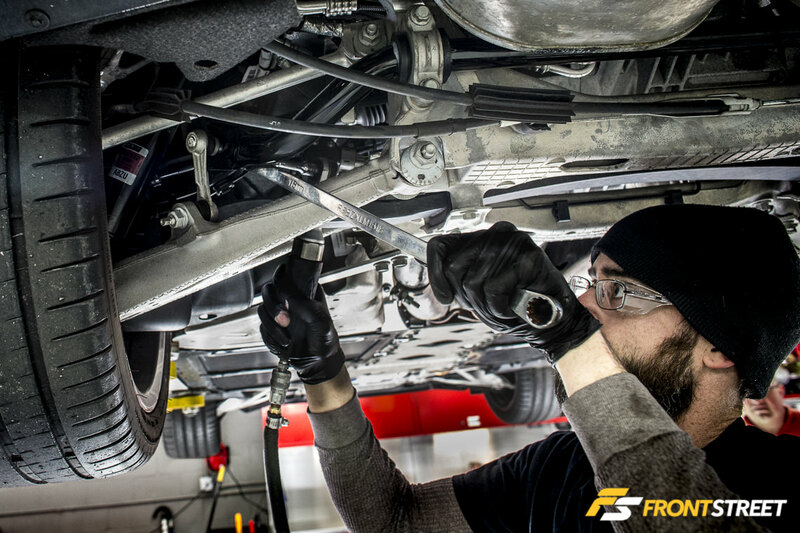 Although the Hotchkis instructions say to remove the bar while attached to the end links, Pat was able to sneak the bar out while leaving the links attached to the lower control arms. Performing the process this way ensured that the end-links remained in the proper position, saving Dulcey from lining them up on the floor based on the previous mounting configuration. For this application, the middle mounting hole of the rear bar (42 percent stiffer than stock) was used. The new bushings were lubed up using the supplied silicone grease, installed onto the new Hotchkis bar, then the bar was set back into place and the end-links situated into the middle hole on each side. Ayad was interested in testing the bar at this stiffness level; it may be moved around later for track days. In the front of the car, these plastic covers that protect the lower control arms must be removed. There are three Torx fasteners per side. It’s important to use an entire package of grease for each pair of bushings (one bar), as the stiffer bushings can induce some noise if not properly lubricated. The kit comes with one package for each bar, so make sure to use it up. Snaking the OE front bar out from under the engine; there is one hose attached to the radiator that’s in the way, seen in the center of the photo. Care needs to be taken during this part of the process to avoid damaging it. Installation is the reverse of removal. In the front of the car, the installation process was a bit more involved, but not overly so. The same six fasteners are involved – one on each end link, two on each saddle bracket, but there are some undercar plastic pieces that get removed first. Seven fasteners permit the removal of the undercar tray, then there are two more plastic covers on the lower control arms to be removed, fastened with three Torx-head screws per side. The hardest part of this portion of the installation was snaking the bar out around a hose from the radiator – but Dulcey had the process complete in approximately 25 minutes, even though we were consistently in his way with the camera. Dulcey reinstalling the underbody components; the Hotchkis C7 Sway Bar install is all wrapped up. This is one of the simpler parts installs for the C7, and the improvement in overall vehicle stability and street performance is impressive. Although the owner has not had a chance to hit the track with the car yet (it’s still winter here in the Northeast), he noticed an improvement immediately.